William Plumer Jacobs was born to Rev. Ferdinand and Mary Elizabeth Redbrook Jacobs in Yorkville, South Carolina, March 15, 1842. Ferdinand had been born in Alexandria, Virginia, and following his education at Hampden-Sydney College and Union Seminary he served churches in Alabama, Georgia, and South Carolina. 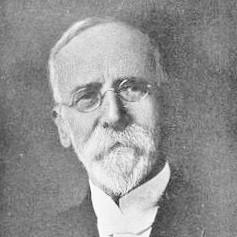 Ferdinand Jacob’s ministry over the years included the presidency of Laurens Female Seminary, principal of the Charleston Female Seminary, and teaching at Oglethorpe University. Young William Plumer Jacobs would follow in his father’s footsteps and be involved in both pastoral and educational work as a Presbyterian minister, but he would also enter other areas of service during his very busy life. Jacobs was educated in South Carolina at the College of Charleston which was followed by ministerial studies at Columbia Theological Seminary. In preparation for the completion of his last year of seminary and gain preaching experience he was licensed in the spring of 1863 by Charleston Presbytery. When he completed his studies he was ordained by South Carolina Presbytery to serve the First Presbyterian Church in Clinton beginning in 1864 and continuing until the dissolution of his call on July 28, 1911. Shortly after beginning his pastorate in Clinton he earned the Master of Arts from the College of Charleston in 1866. During the forty-seven years of his ministry the communicant membership of First Church grew from around 40 to over 300. In addition to his pastoral responsibilities with the Clinton congregation, he served both the Duncan’s Creek and Shady Grove Churches, 1864-73, was the stated supply of the Rockbridge Church, 1870-87, and was often invited to preach in churches throughout his presbytery and synod. The influence upon Rev. Jacobs by his father’s interest in education came forth in his work to develop better educational opportunities in Clinton. Following the Civil War, the South’s recovery was slow due to a collapsed economy and the harshness of Reconstruction. The administrative and institutional structures for educating the Southern youth had to be rebuilt. W. P. Jacobs saw the need in Clinton and organized the Clinton High School Association in 1872. An old pre-war academy building at the edge of town was renovated for the school and William States Lee of Edisto Island was hired as its principal and teacher. However, the new school was private and only those who could afford the fees could access an education. From the small start of the Clinton High School Association came the organization that would take the next step in education, the Clinton College Association. On October 11, 1880, Clinton College, currently Presbyterian College, was organized as a Presbyterian coeducational institution with the driving force coming from Rev. Jacobs and the First Church congregation. Rev. 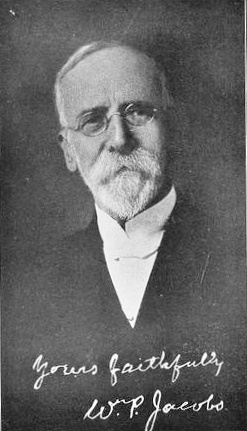 Jacobs would serve as president of the board for over 20 years. W. S. Lee went on from his high school work to be the first president of Clinton College, and a local minister and educator, Zelotes Holmes, was hired to serve on the faculty in those first years. Even though serving churches and leading in higher education would seem to be enough work for Rev. Jacobs, his compassion for the homeless children of his day led to the founding of Thornwell Orphanage in Clinton. 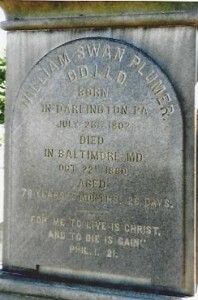 His mother, Mary Elizabeth, had been an orphan until she was adopted into the family of William Swan Plumer, thus the “William Plumer” in William Plumer Jacobs was her way of honoring her loving adoptive parents. The name, “Thornwell Orphanage,” was chosen by Jacobs to both honor and remember his seminary professor, James H. Thornwell, who had himself been orphaned as a boy. A board for the institution was organized in 1873, the first building was begun in 1874, and the first orphans were admitted on October 1, 1875. The orphanage went through difficult times but by 1909 the number of children in Thornwell was such that they could no longer worship with First Presbyterian Church due to the limits of its seating, so Enoree Presbytery organized the Thornwell Memorial Church for the orphan children. Dr. Jacobs was called to serve the Thornwell Church while continuing his call to First Church, but due to the heavy load of work and his increasing age he resigned from First Church after a few years and dedicated his pastoral efforts to Thornwell Memorial. 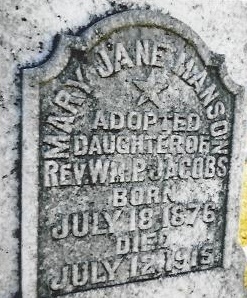 Dr. Jacobs love for the children of the orphanage is seen in a grave marker in the First Church cemetery for Mary Jane Manson (1876-1915) or “Mollie,” who was the daughter adopted by him on June 17, 1896 (Diary, 318). It is appropriate that the compassionate founder of an orphanage would adopt a child into his home (Mrs. Jacobs had died in 1879). According to the dates on the grave memorial, Mollie was approaching her twentieth birthday when she was adopted. It may seem unusual to adopt a twenty-year-old woman, but it should be remembered that Victorians thought propriety, manners, and family were important for a young lady’s social position and necessary for courting and marriage. Another possibility for the late adoption might have been that Mollie was unable to take care of herself due to a physical or psychological challenge. When Mollie died, W. P. Jacobs commented, “We buried Mollie, yesterday, at 6 in the evening. A lovely evening. God smiled upon her—a beautiful service, men and women mourned. All have been good to me” (Diary, 462). W. P. Jacobs was a printer and publisher, faithful churchman, and highly honored by his peers. In 1886, he was given the LL.D. by Erskine College, Due West, South Carolina. He not only founded and wrote much of the contents of the periodicals, Our Monthly, True Witness, Farm and Garden, and Orphan Work, but they were printed on a press obtained by him and used to help the orphanage as well as publish presbytery minutes and materials. Dr. Jacobs’s faithfulness as a churchman was exemplified in his regular attendance of the church judicatories, and his service as the clerk of South Carolina Presbytery, 1875-1878, and then Enoree Presbytery, 1879-1897. W. P. Jacobs had married Mary Jane Dillard in Coldwater, South Carolina, April 20, 1865. There were at least seven children born to William and Mary Jacobs. The five that lived to be adults included Florence Lee, James Ferdinand, William States, John Dillard, and Thornwell. In the cemetery abutting the First Presbyterian Church in Clinton are markers for two children that died in infancy. One stone may be for Eugene Ferdinand who was born in 1869 (Diary, 128), and the name of another child is not known though the “W. J. J.” initials are clear on the grave marker. Given the high infant mortality rate of the era, it is possible that other children died in infancy and their deaths were not mentioned in Dr. Jacobs’s diary. Sources—Clarification editing was done by the author on August 5, 2015. The books by Ben Hay Hammet, The Spirit of PC: A Centennial History of Presbyterian College, Clinton: Jacobs Press, 1982; Thornwell Jacobs, The Life of William Plumer Jacobs, New York: Fleming H. Revell, 1918, and edited by the same author, Diary of William Plumer Jacobs, Oglethorpe: Oglethorpe University Press, 1937, were very helpful. The bibliographic information for the Synod of South Carolina minutes containing the Jacobs memorial is, Minutes of the Synod of South Carolina Held At Seneca, South Carolina, November 6-8, 1917, Spartanburg: Band & White Printers, . A president of the orphanage, L. Ross Lynn, wrote The Story of Thornwell Orphanage, 1875-1925. Note—Presbyterian College has the office of Dr. Jacobs including his library and furniture reconstructed for display in its archives.